As part of its annual World Ultra Wealth Report, wealth intelligence firm Wealth-X created a map showing which US states are home to the most super-rich people (defined as those with $US30 million or more in assets). 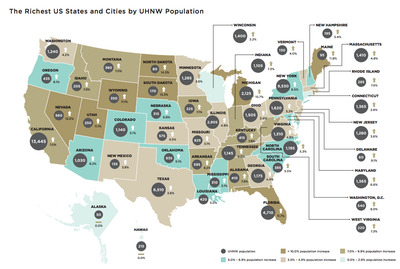 Some states have more ultra-high-net-worth (UHNW) individuals than major countries. Wealth-X found that California had more super rich people than the United Kingdom (13,445 v. 11,510); New York had more than India (9,530 v. 8,595); and Texas had more than Canada (6,510 v. 5,305). 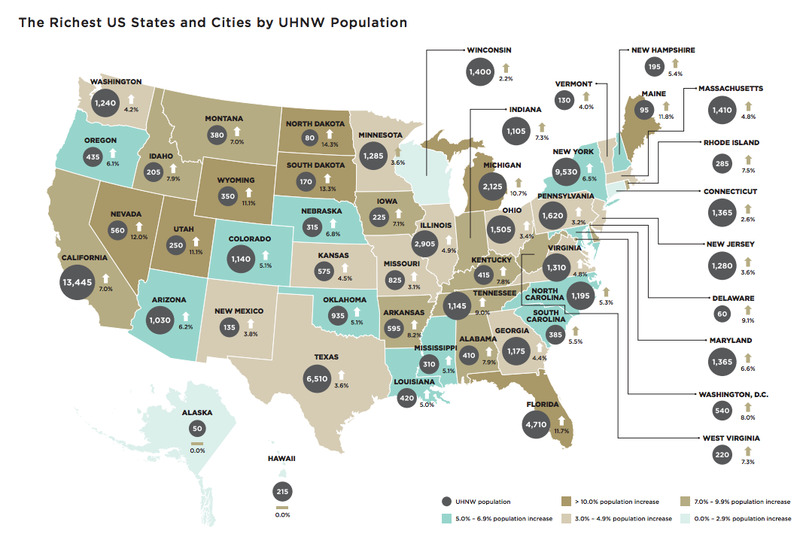 The numbers in the grey circles show how many UHNW individuals live in each state; colours indicate change in that number from 2013. In 2014, the world’s UHNW population grew 6% to 211,275, and that group’s collective wealth increased 7% to nearly $US30 trillion, according to Wealth-X. Although these individuals account for only 0.004% of the world’s adult population, they control almost 13% of the world’s total wealth. “Even though North America was strongly affected by the Global Financial Crisis, recovery for the region’s wealthiest was swift,” the report noted. The chart below shows how North America’s UHNW population and their wealth have grown (and are projected to grow) in this decade.